Soil Health Nexus > Blog > Manure > Can Manure Improve Soil Health? Can Manure Improve Soil Health? Is there a correlation between soil health (or soil productivity) and manure? A Missouri team analyzed many soil health related variables and manure land application details, based on data collected under the Missouri Cover Crop Cost-Share Program and experimental plots. On a state-level, no significant difference was found between the fields with and without manure application for most of the variables collected, except for phosphorus. The lack of correlation is mostly likely because only a small portion of the state-wide samples were associated with manure land application, and the samples were highly variable in tillage, soil type or series, crop, and manure type, application rate and methods, and lack of consistent, multi-year data from similar fields. However, narrowing down to county level, manure applications increased active carbon contents for two of the top three counties where manure application data was collected. The manure application also significantly increased organic carbon, phosphorus, potentially mineralizable nitrogen, and water stable aggregate values for another county. In order to better examine the effects of manure land application, data collected from an experimental field plots with consistent tillage, and repeated crop and fertilizer treatments was analyzed. The manure application has clearly resulted in higher soil organic carbon, active carbon, phosphorus, and water stable aggregates, and lower bulk density. Figure 1. Manure being applied in the corn field, using a drag-hose system. These findings confirm that the benefits of manure application to soil health, but also increase the phosphorus level. The findings regarding manure use and important soil health indicators are important to be shared with stakeholders. 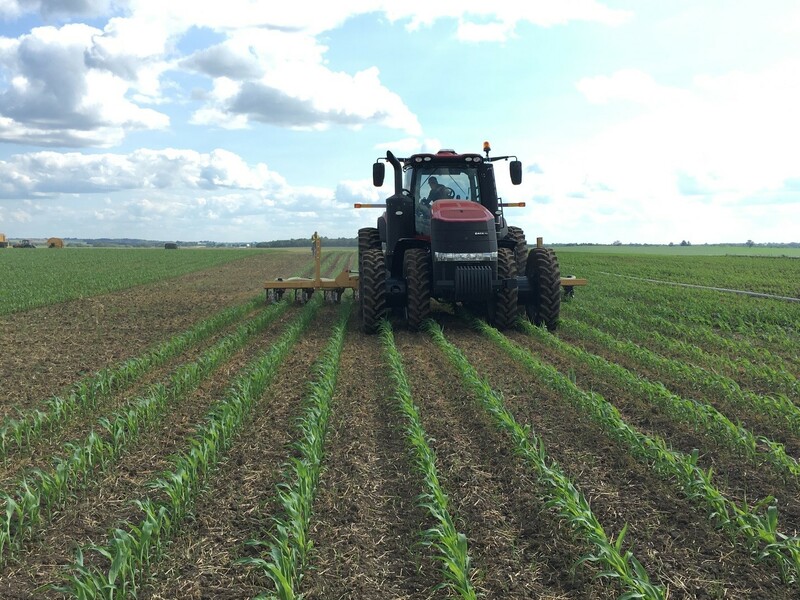 While considering measurable economic and environmental impacts of nutrient and manure management, especially for increasing the carbon content in the crop fields, manure land application can be one of the recommended practices. What are the Soil Health Indicators? Total organic carbon and active carbon Organic contents has been shown to improve biological (e.g. greater diversity of micorbes), chemical (e.g. better nutrient cycling), and physical (e.g. improved water infiltration and holding capacity) soil properties. Bray 1 phosphorus An estimate of available P levels for plants. Too little P can impact yield and too much P can contribute to high nutrient loss and potential environmental issues. Potentially mineralizable nitrogen A measure of soil biological activity and efficiency. Too much nitrogen in the soil can also mean high losses. Bulk density Indicator of soil compaction and the soil functions of regulating water, producing biomass, and providing support for plants and structures. High bulk density would generally reduce soil productivity. Water stable aggregate Indicator of how soil particles bound together that resist breaking apart, even during wet soil conditions. It may be an indicator of soil water functions such as infiltration. The more uniform soil series and repeated experimental field plots provide a more controlled and homogenous comparison for the research of manure land application. The experimental field plot data agreed with the within-county comparisons, that the manure application was able to affect many of the soil health indicators, such as organic carbon contents. Figure 2. Comparisons of organic carbon contents for the state-wide and Sanborn field plot soil samples, the plots depict median (solid line), mean (x), quartile box, and minimum/maximum values. The state-wide samples were state-wide average (overall), fields treated with manure (Soil+manure), and fields did not have manure application (Soil-manure). The field plot treatments were full fertility (FF), manure (M), and no fertility (NF). Manure application has shown to reduce the overall soil density, which is important for the soil aeration, and ability to regulate water and provide support for plants. Figure 3. Bulk density of state-wide and Sanborn field soil samples, the plots depict median (solid line), mean (x), quartile box, and minimum/maximum values. The state-wide samples were state-wide average (overall), fields treated with manure (Soil+manure), and fields did not have manure application (Soil-manure). The field plot treatments were full fertility (FF), manure (M), and no fertility (NF). For more information, see our data brief and report from the mini-grant. The team plans to continue collect and analyze more data, which should help better explain and improve the findings. When multiple years of data become available, the effects of cover-crop could also be analyzed. Funding for this data analysis and report are provided by the North Central Region Water Network – a 12-state collaboration between Extension water resource professionals and university, federal, state, NGO and industry partners; and Soil Health Institute. DNR, 2016. Soil and Water Conservation, Missouri Department of Natural Resources. The Missouri N340 Cover Crop Cost-Share Program. https://dnr.mo.gov/env/swcp/docs/07-V-eligible-practices.pdf#page=34. Accessed Nov 16, 2016., 20 p.
Miles, R., J. R. Brown, 2011. The Sanborn Field Experiment: Implications for Long Term Soil Organic Carbon Levels. Agronomy Journal. 103 (1), 268-278. http://dx.doi.org/10.2134/agronj2010.0221s. USDA, 2004. Soil Survey Laboratory Methods Manual. Soil Survey Investigations Report No. 42. U.S. Deptartment of Agriculture, Natural Resource Conservation Services. Available: https://www.nrcs.usda.gov/Internet/FSE_DOCUMENTS/nrcseprd1026807.pdf. Accessed on 05 September 2017.
hay, Soil Health is very important for land and I am sure Manure must help soil.